In this article, we’ll focus on 1 to 1s, which provide a key opportunity every week (yes, every week) to engage with your staff on a deep, personal level. As a manager, you can have a tremendous impact on the performance and lives of your staff by doing them mindfully and to a high standard. Simply doing them isn’t difficult, but doing them well is an area that required consistent focus. Cadence and regularity are key in these meetings. Book them in at the same time and place each week and commit to them. Do not move them unless absolutely necessary. Having a scheduled regular touchpoint with your direct reports brings a predictability into your relationship and shows that you care about being there for them week in, week out. It is critical that these meetings are done in a private room. Do not do them in a public area in the office, such as the breakout area or at their desks. This prevents any private conversation from occurring and may even make your direct report feel like you would rather not hear it; you absolutely want to. The same observation is true for managers who take their 1 to 1s outside the building to a nearby coffee shop. As nice as it is from a social perspective, the lack of formality and privacy in the conversation is detrimental to the quality of the conversation. After all, the meeting is about open and honest feedback and personal development; you owe it to each other to find a quiet, private place, rather than shouting over the top of the hissing milk wand. So, why are 1 to 1s so important? Firstly, it is the one completely uninterrupted hour that your direct reports get to spend with you every week. In that time, neither of you are meant to be doing anything else; your primary purpose is to be present and to talk without distraction. Keep emails closed and don’t get interrupted by phone calls. The private element of the meeting makes it the ideal opportunity each week to talk about performance and developmental issues and to give them a chance to speak in a way that they wouldn’t in the public office space, e.g. to vent about a colleague who they had a conflict with, or raise their concerns about an ongoing project. Secondly, this private space is where you build rapport and trust. It is critical that you are approachable as a manager, and building a transparent and trusting relationship through these meetings ensures that your staff will be encouraged to consistently be open with you and feel safe approaching you if they are in need. Having a good relationship with a manager is a vital factor contributing towards happiness at work, and has often been reported in articles as the vital factor. Thirdly, this is where you, as a manager, get to exercise your influence, which is exactly what your job is about. You can offer advice, opinions, coaching, and support in this meeting. You can nudge a variety of issues in a particular direction each week, and in the long term, your staff and their projects will be on the right track. Irregular 1 to 1s, or a complete lack of them, can cause staff to drift in their focus and performance, creating a much more difficult situation to rectify in the future. This is especially true of performance issues which, when left alone for too long, become nearly impossible to repair. In our previous articles, we advocated having a shared document between you and each direct report that is used for the 1 to 1s. With my own direct reports, I’ll typically jot down notes on what I’d like to cover as the week progresses. Depending on the person, this may be anywhere between 0 and 10 items. Some of my staff do the same, but not all – some prefer to come with paper notes. That’s fine, but I still keep the shared document as my reference guide. I can use it in the future if I ever need reminding about what events have occurred, and it is especially useful to review historically at performance review time. Despite the fact that this is your best chance to positively impact your staff each week, the paradoxical stance you must adopt is that the meeting is theirs, not yours. What this means is that you must “keep the thought bubble over their head” for as much of the meeting as possible. Do this by asking leading questions, nudging the conversation in particular directions and most of all, by listening. It’s not your job to direct the conversation or pontificate in this meeting; it’s your job to absorb and guide. Try and get your direct report to do 70% of the talking. If you feel like solving their problem for them, don’t. Ask another question and let them arrive at the conclusion themselves. This is an art that takes some practice, although some are naturally good at this with little to no training. The administrative side of the meeting involves getting updates on key projects, asking how work is going, and so on. It’s very easy for you to just nod and listen, but it can be helpful to ask some questions to provoke discussion: “How could we complete that exploration quicker?”, “Is that the correct technical approach?”, “Have you seen any open source software that could solve that problem for us?”. You may have absolutely no idea of the answers to any of these questions, but they work very well for stimulating discussion. It’s worth clarifying that your 1 to 1s are not primarily there for you to receive updates on projects. They would be very dull if that was the only reason that they were there. Derive enough about the current projects to report upwards and feel happy, but don’t insist on every little detail. Keep most of the time in the meeting free to talk about personal development and wider coaching issues. You’ll both be happier for this. Once again, this is why it’s their meeting: let them dig into their mind and surface the things that really matter. They’ll know. It’s worth keeping in mind your direct report’s goals and frequently stimulating discussion around them. How are they getting on? These may be technical goals such as speeding up data processing in their service by 10X, or a personal goal such as being a more confident public speaker. Ask whether they made any progress in the last week, and if not, how they could try to find some time in the next week to work on them. Checking back in on goals is additionally a great way to show that you are thinking of their development and that you care. 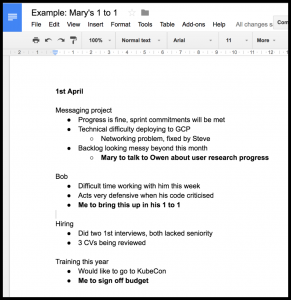 Throughout the 1 to 1, it’s useful to be jotting down notes in the shared document and assigning actions. Review the actions at the end of the meeting. 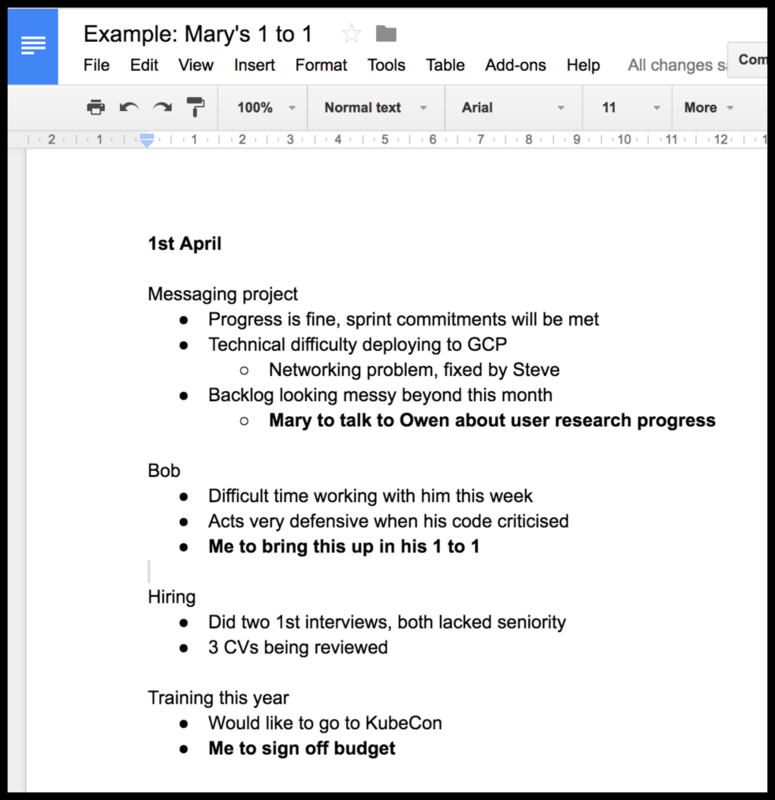 You can of course jot on paper or even keep things in your head, but I find that it’s easier to forget things and transcribing later to the shared document creates more work. You could sit around a laptop together, or both have the document open on your separate screens. Depending on the AV setup in the room, you could display it on the computer there via HDMI, AirPlay or similar. The point is that your notes are not a secret. They’re for both of you. These notes become a wonderful historical reference as time passes. You can scan back over them when performance reviews are due to prompt yourself on what your staff been doing. You know that you can dump notes in there at any time, and you’ll have them in front of you to talk about the next time that you meet. If you haven’t done 1 to 1s before, then this may seem like a lot of work. But, with time, you will find that having such a variety of opinions of what is going on within your team gives you an excellent ability to make informed decisions more broadly and discover issues before they become serious. The simple act of spending time with your direct reports should not be underestimated either: you can build strong relationships with each other that will either identify the future superstars in your organization. Do you have a culture of 1 to 1s in your team? If not, why not?